An original letter of correspondence between Joshua Coffin Chase and S. M. Crowell, a laborer at Isleworth Grove. Topics discussed in the letter include the employment of Reid Rogers to assist Crowell in irrigation, spraying, fertilizing, and other tasks at Isleworth Grove. 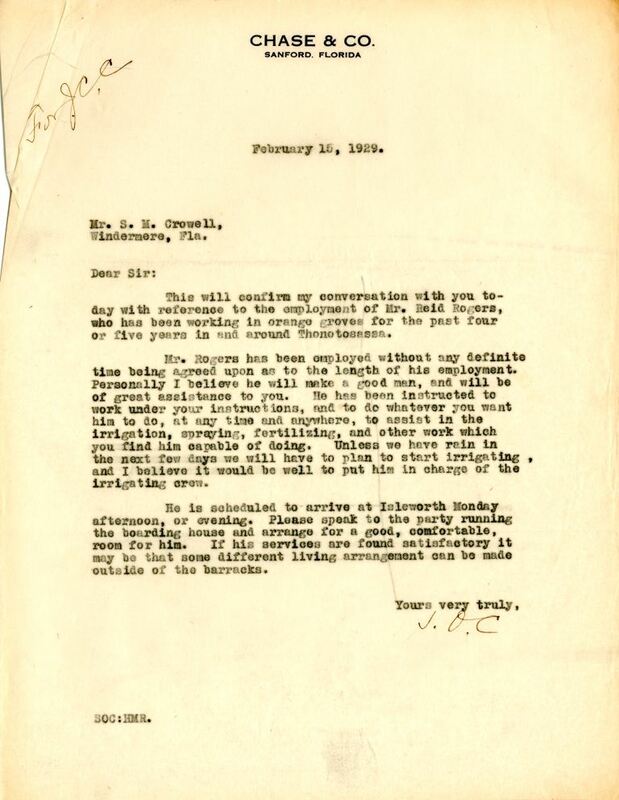 Original letter from Joshua Coffin Chase to S. M. Crowell, February 15, 1929: box 49, folder 20.84, Chase Collection (MS 14), Special and Area Studies Collections, George A. Smathers Libraries, University of Florida, Gainesville, Florida. 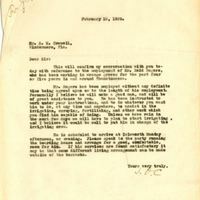 Digital reproduction of original letter from Joshua Coffin Chase to S. M. Crowell, February 15, 1929. This will confirm my conversation with you today with reference to the employment of Mr. Reid Rogers, who has been working in orange groves for the past four or five years in and around Thonotosassa. Mr. Rogers has been employed without any definite time being agreed upon as to the length of his employment. Personally I believe he will make a good man, and will be of great assistance to you. He has been instructed to work under your instructions, and to do whatever you want him to do, at any time and anywhere, to assist in the irrigation, spraying, fertilizing, and other work which you find him capable of doing. Unless we have rain in the net dew days we will have to plan to start irrigating , and I believe it would be well to put him in charge of the irrigating crew. He is scheduled to arrive at Isleworth Monday afternoon, or evening. Please speak to the party running the boarding house and arrange for a good, comfortable, room for him. If his services are found satisfactory it may be that some different living arrangement can be made outside of the barracks. Chase, Joshua Coffin. “Letter from Joshua Coffin Chase to S. M. Crowell (February 15, 1929).” RICHES of Central Florida accessed April 20, 2019, https://richesmi.cah.ucf.edu/omeka/items/show/2757.